It has been nearly two whole days since anyone in our house has been suffering from some kind of illness! And hooray for health on Christmas Day, for lots of reasons, including breakfast. We don't have a lot of Christmas traditions at our house, and the ones we do have are a little bit younger than Wyatt. But they are good. One tradition is having latkes on Christmas Eve. 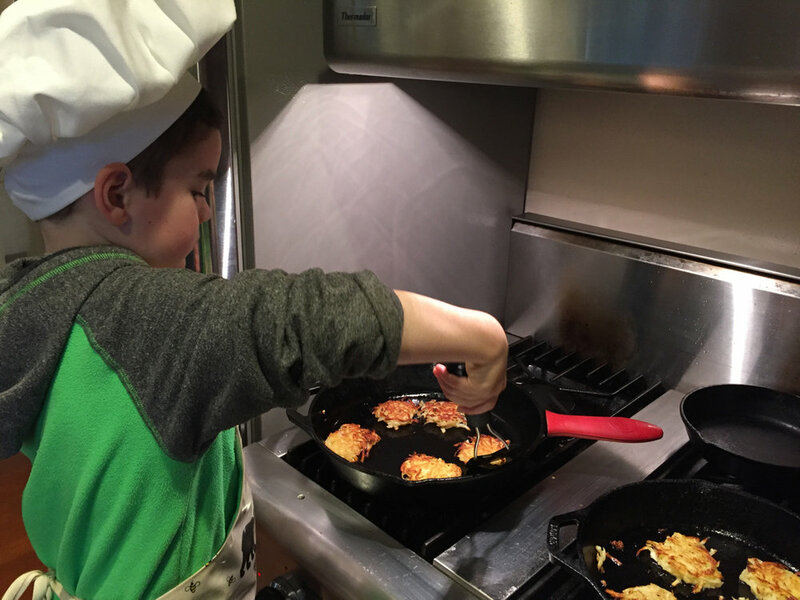 I make them every year, and every year, I tell Wyatt about staying up into the wee-hours of the morning with Auntie Debbie, one of my best friends in the whole world, making what might have been hundreds of latkes for her Chanukah party. The fun we had cooking the latkes far outweighed the work (but maybe not the olive oil required). This year, I followed Smitten Kitchen's recipe, including suggested improvements. I subbed potato starch for flour, and I used the truly ingenious suggestion to use cheese cloth to squeeze the moisture out of the potatoes and onion. Wyatt, who became quite capable with the spatula, cooked more than half of the latkes this year. Another tradition is having "Whatever We Want" for Christmas breakfast. This year, Wyatt knew he wanted ice cream but couldn't decide which flavor, and that meant that we couldn't decide on cookies, pie, or anything else to go with it. We remained stuck until last Wednesday, when we visited Toy Boat Dessert Cafe with dear friends who are moving away (sniff!). I ordered peppermint stick ice cream, and after Wyatt tried it, he announced, "NO FAIR. That's so much better than my mint chip." Suddenly, the choice for Christmas breakfast ice cream was clear. When cheesecake came up for some (divinely inspired) reason on Thursday, our menu was suddenly set. I used David Lebovitz's recipe for vanilla ice cream (but omitted the vanilla extract and just removed the halved vanilla bean after 30 minutes). Thanks to the recommendation of my trainer, Doug (who's a force in the gym and in the kitchen), we made the ice cream peppermint stick flavor by adding 1/2 teaspoon of peppermint extract just before freezing, and by mixing in about 7 full-sized, crushed candy canes once the ice cream was nearly frozen. Wyatt got to use a mallet to smash the candy canes to bits. He got the best job, obviously. For the cheesecake, I used the Nourishing Tradition's recipe as a jumping-off point. I made the cream cheese. I also totally pushed my luck on the proportions of ingredients, forgot an egg white, and I had to use the Vitamix for the whole recipe (thanks to the Cusinart blade recall). Nevertheless, the cheesecake turned out to be the best I've made yet. I added the remaining smashed candy canes to the center just before serving to make it look more festive. On Christmas morning, we started the ice cream maker, opened all the presents, lit the candles on the dinner table, and enjoyed every bite of our ice cream-in-cones-with-cheesecake. This Best Breakfast Ever set us up for a very merry Christmas, indeed.